How’s the name of the dessert??? Haha! You all are drooling already right! Its a BIG name but the perfect name for this dessert. This my dear friends, is what chocolate dreams are made of.! A brand new addition to the blog. 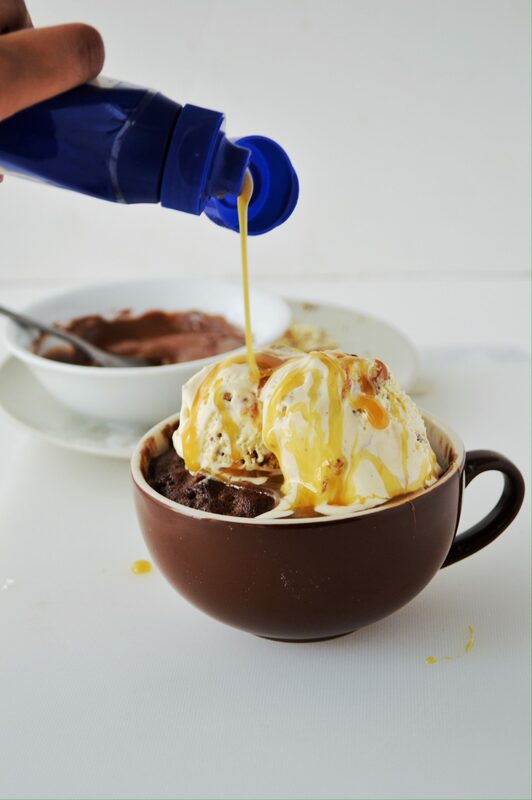 I happily present to you ooey, gooey, fudgy, melty, chewy, smooth, creamy……….and so on, brownie mug cake. Yes, exactly! the one that you make in the microwave. 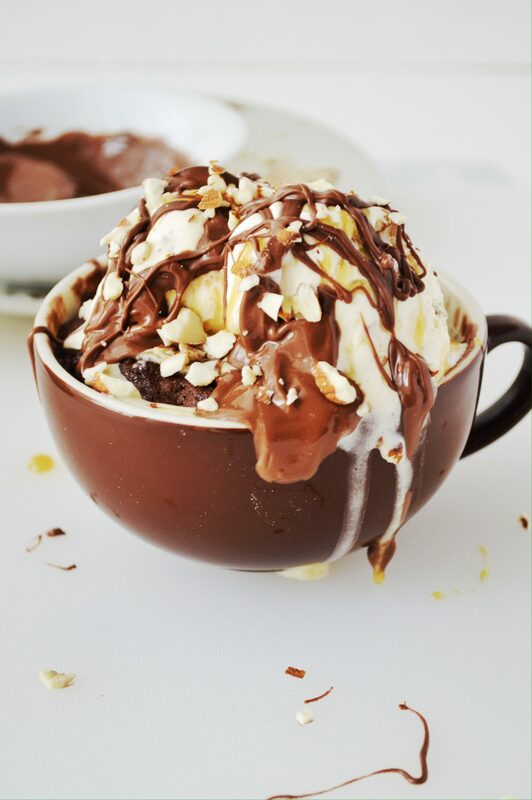 This is my second mug cake post, i had posted minute mug cake earlier which you all really appreciated. 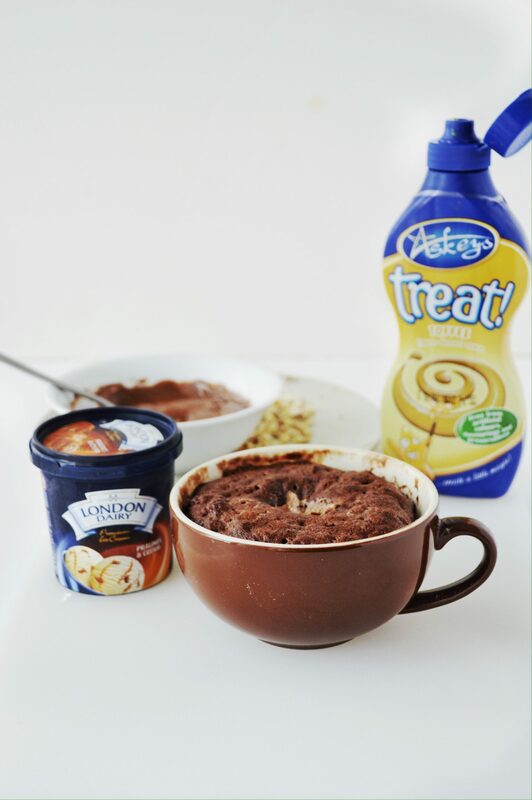 I really love making mug cakes because, obviously its so easy to put together. 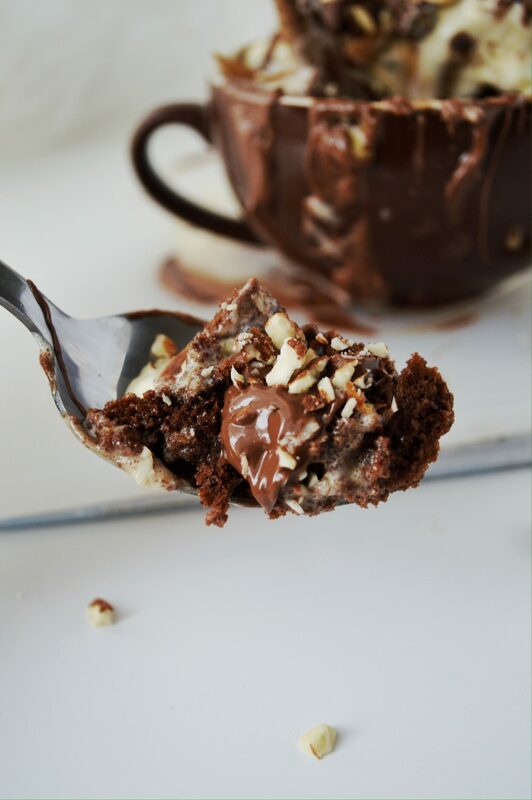 This cake turned out so wonderfully…sinfully decadent with warm chocolate oozing out when you dig in with the spoon. This recipe is great, microwaved in less than 2 minutes, the ingredients which you will have ready in your kitchen pantry-so easy to prepare and tastes like……no words to explain, you can make out from the picture itself, right?! The only downside is the number of pounds it packs- its a bit too high on calories as you guys can say. For those who are figure conscious or health conscious, just make smaller servings in small mugs. You can make it in 2 medium mugs. 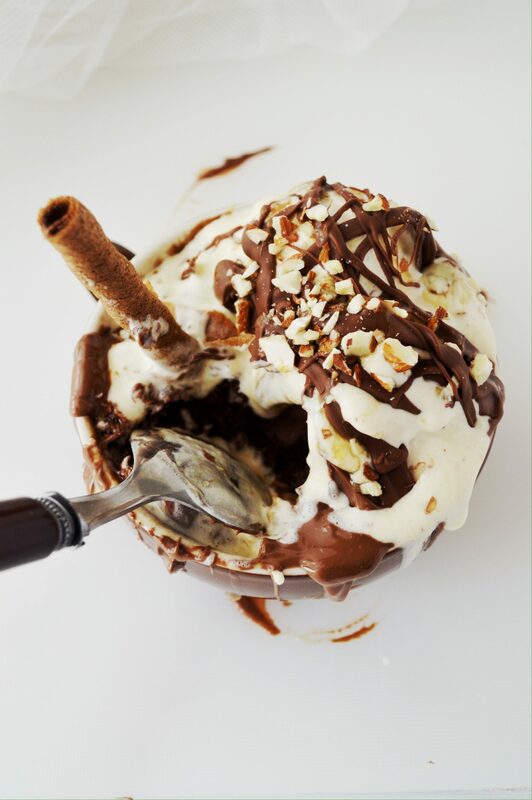 What makes this even more rich is the icecream, i used pralines and cream- my fav and topped it with toffee sauce, melted chocolate and crushed almonds. Ooooooh SOOOO good! Irresistibly incredible! 1. Place the butter and chocolate chips on the mug you are goin to make the cake and microwave for a total of 45 seconds but you have to stir it every 15 second intervals (so a total of three stirs). 2. 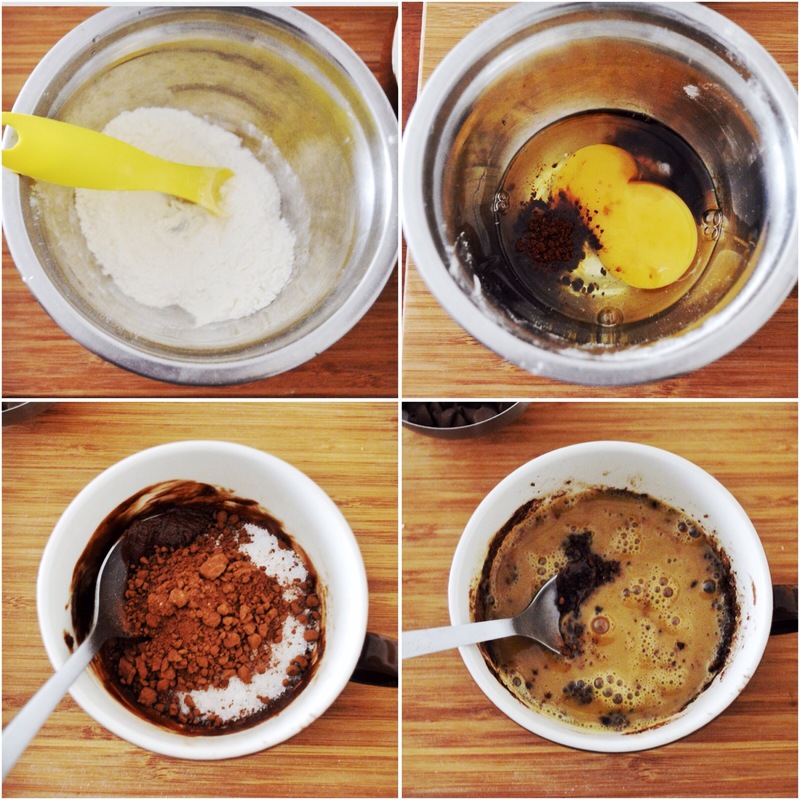 In another bowl, whisk together the egg, vanilla essence, and coffee powder. 3. In a separate bowl, whisk together the flour, baking powder, and salt. 4. 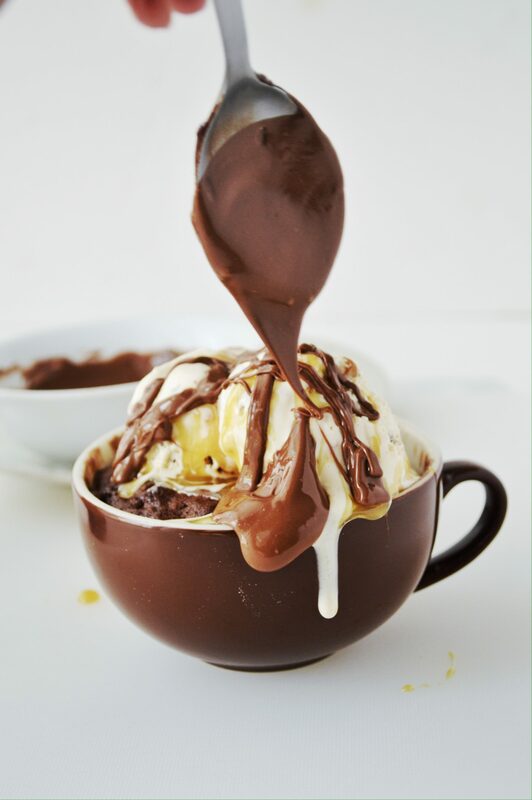 When the chocolate is melted in your mug, stir in the sugar and cocoa powder. Stir in the egg mixture. Then stir in the flour mix. Stir to eliminate lumps. 5. 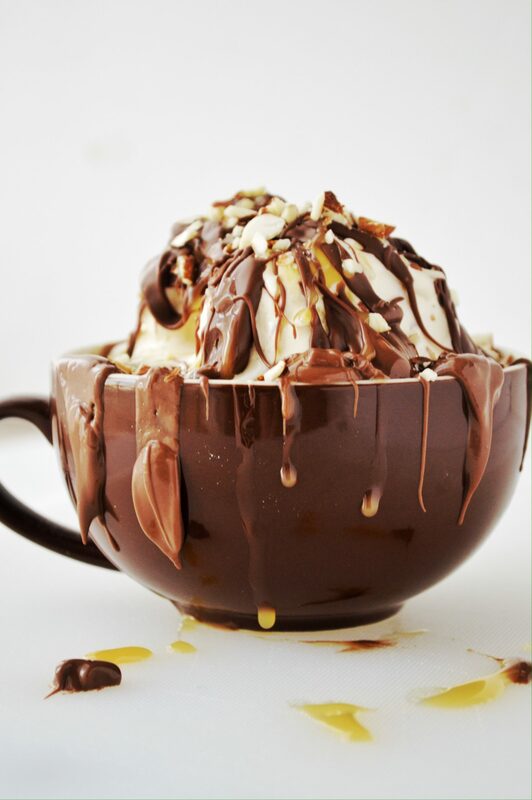 Microwave the mug for 30 seconds. Stir. 6. Microwave for another 30 seconds. 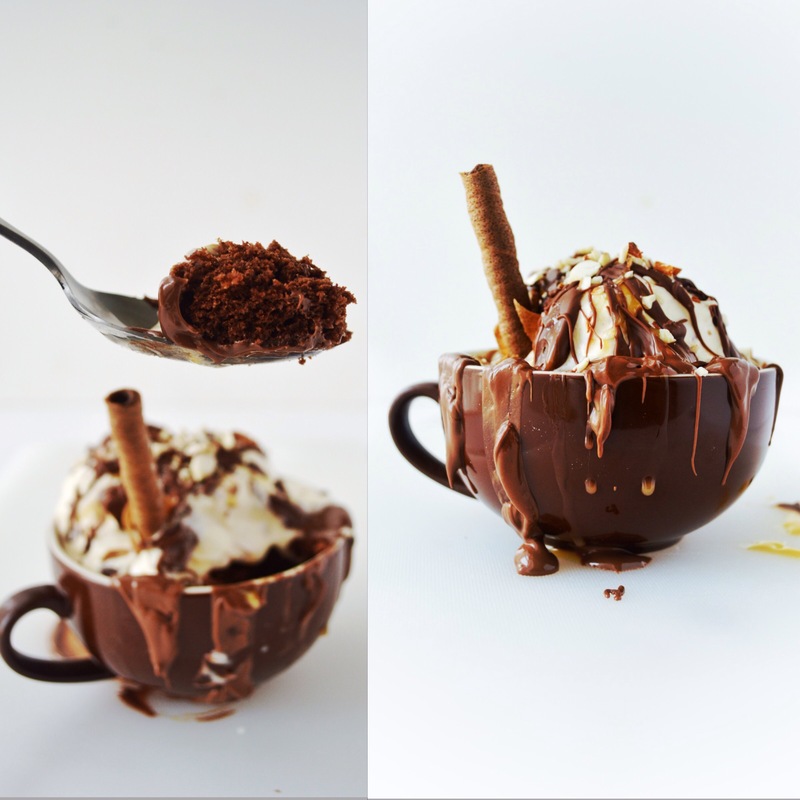 The cake will rise to the top of your mug like a soufflé. Take out and press in the chocolate down into the centre of the cake. Microwave further for 30-35 seconds. Let the cake cool while you prepare the toppings. 1. 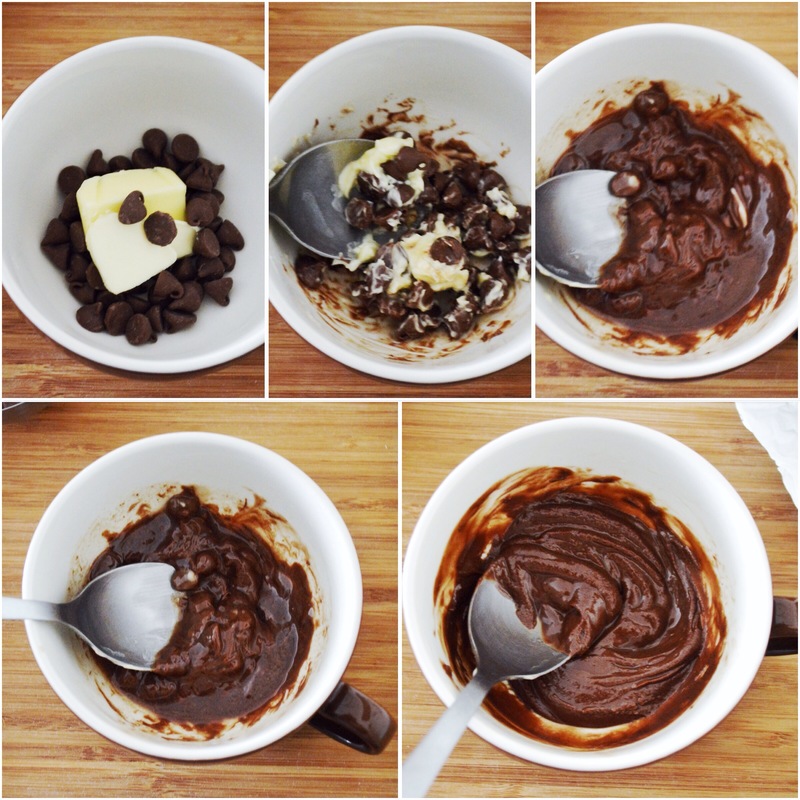 Melt the chocolate in the microwave by heating for 20 second interval, stirring between each, until melty. I had to keep only for two twenty seconds interval. 1. Place two scoops of icecream on top of cake. 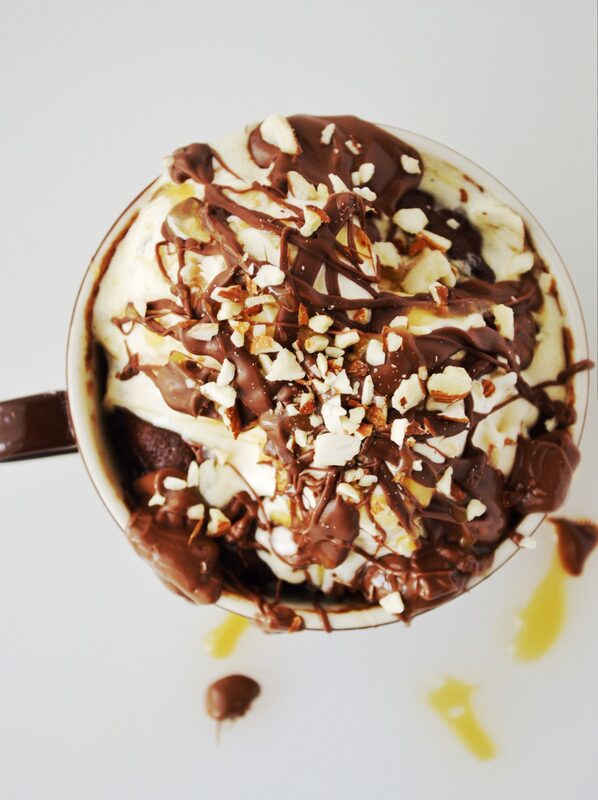 Drizzle the caramel sauce, the chocolate sauce and the crushed nuts on top. You can add crushed biscuit, and whipped cream too. ✔️ Even though you are adding coffee powder, there won’t be any coffee flavor. It only enhances the chocolate flavor. ✔️ You can use any flavor ice cream you like, but what would go well with the cake according to me are pralines n cream, cookies n cream or vanilla flavor. ✔️ Whipped cream can be used as a topping too. ✔️ Make sure you push the chocolate deep into the cake until it is fully covered. I didnt do that so, it was seen as a dent on top after baking. ✔️ Please note that the cooking time will depend on the microwave wattage. 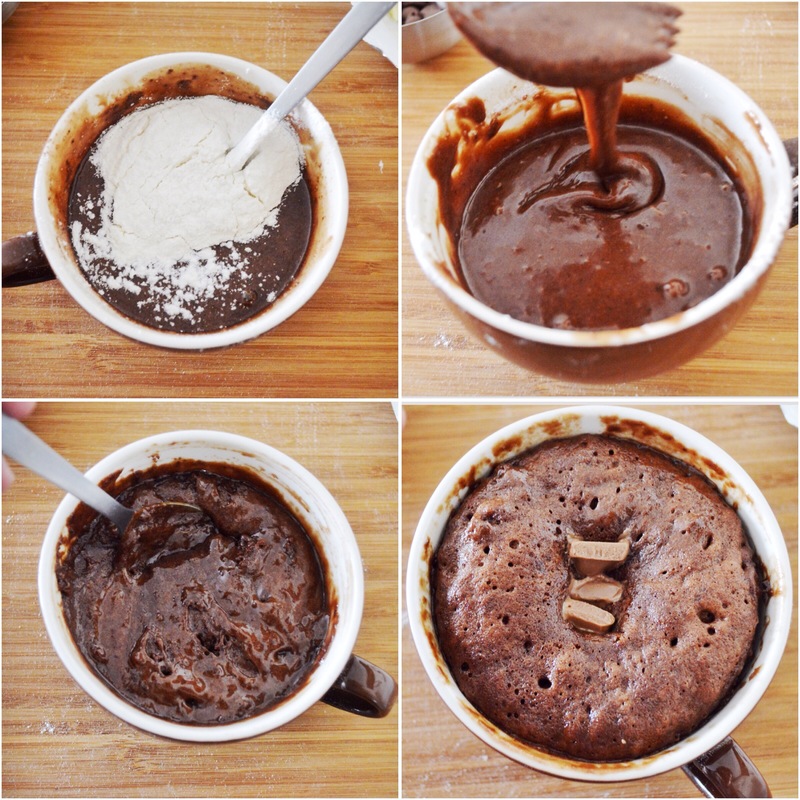 The key for perfect mug cake is that you dont overcook the batter. The cake should rise a bit, ideally with a fluffy, moist, gooey texture and glossy top. The more you will cook, the more the cake will harden up and dry-so slightly undercook and keep an eye on them all the time. Oh Lord. Just as I have been eating healthily, you put this up! Sadiaaa! I will have to have this now, won’t I? 😛 Well done! Pictures once again are superb! This. This just isn’t FAIR. Gah! 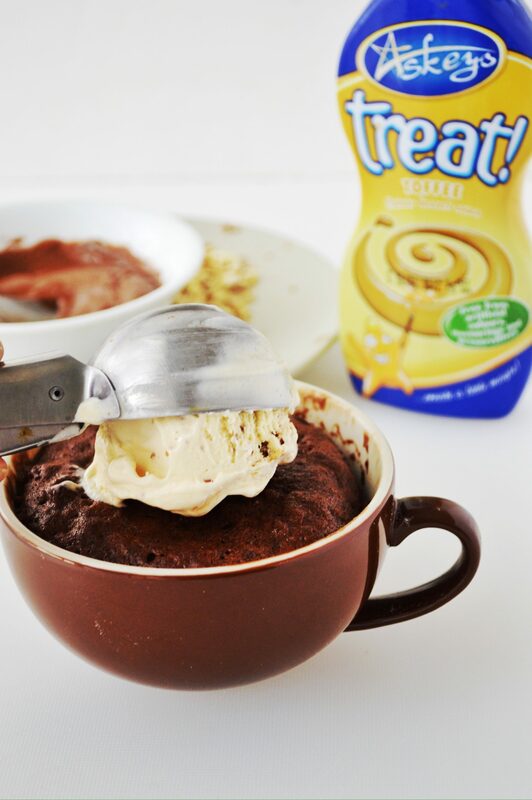 Sadia, this mug cake looks PHENOMENAL. I almost have no words. 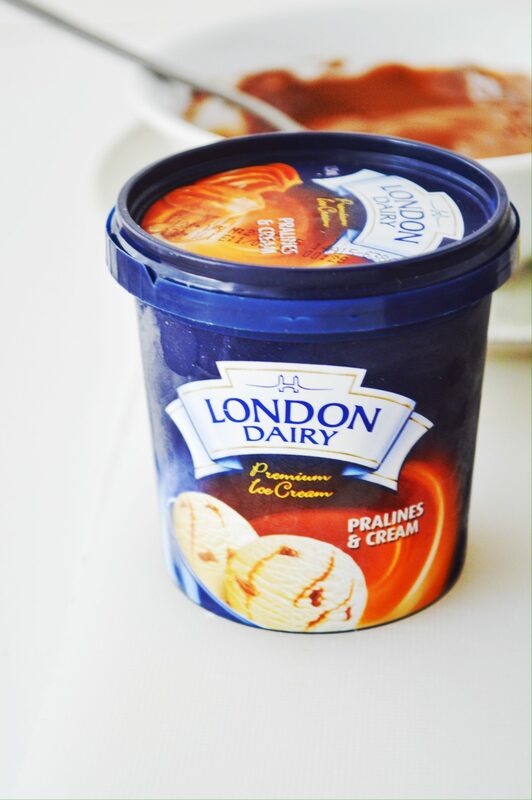 Perfect when you need instant gratification for your cravings! 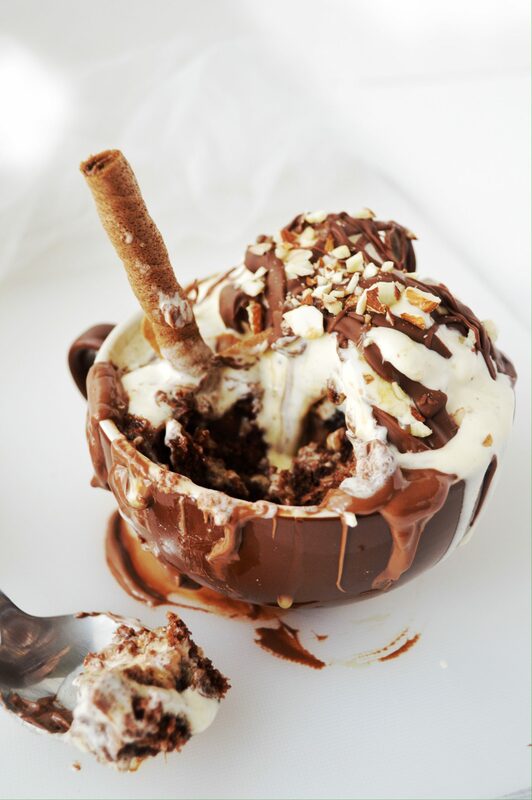 Looks decadent! Oh my Gawdddddd!!! This is what the gods must be eating. Super yummy Sadia. I’m itching to try it out! Thaanks! 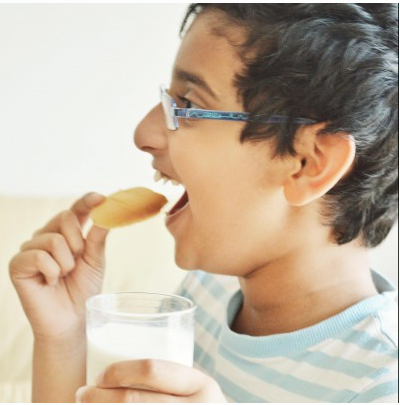 I wish i had a food taster neighbor, seriously! My husband has been trying to diet for soo long and because he is my guinea pig, its not working. Hehe! Ooey gooey is right my friend! 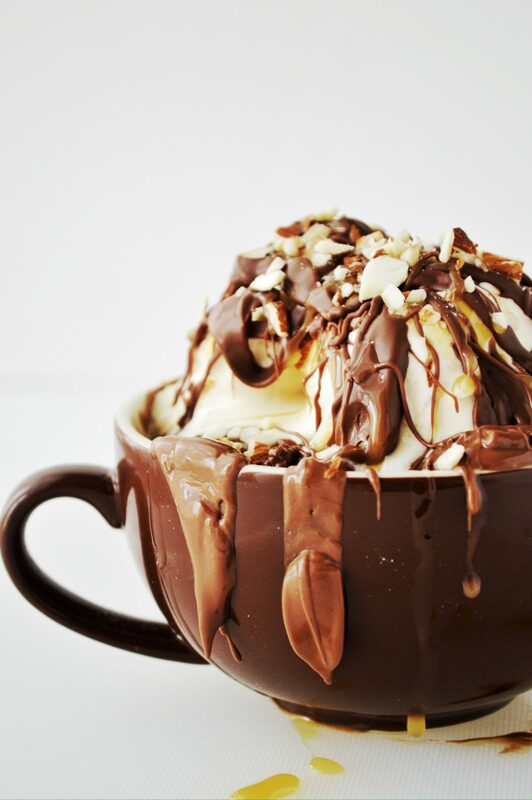 Oh my goodness does this look delicious. I can see this in a restaurant it’s that spectacular! Love it! Oh god.. how decadent! 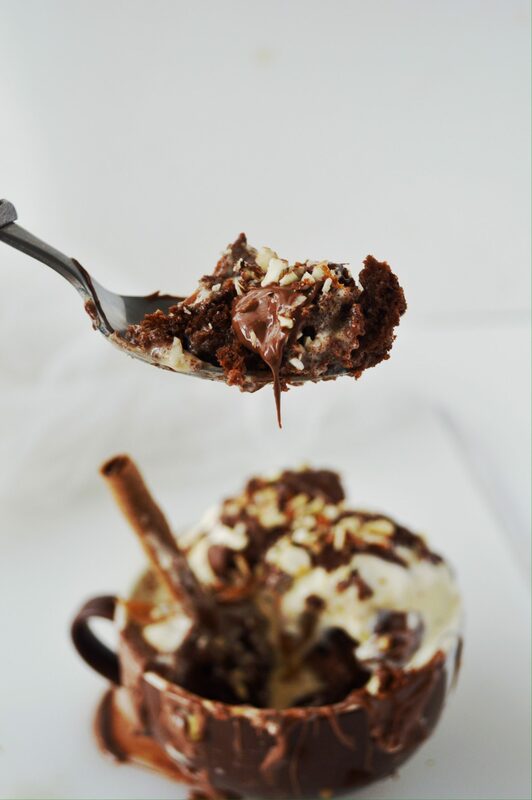 It’s safe to say my chocolate cravings have definitely kicked in after seeing the images. 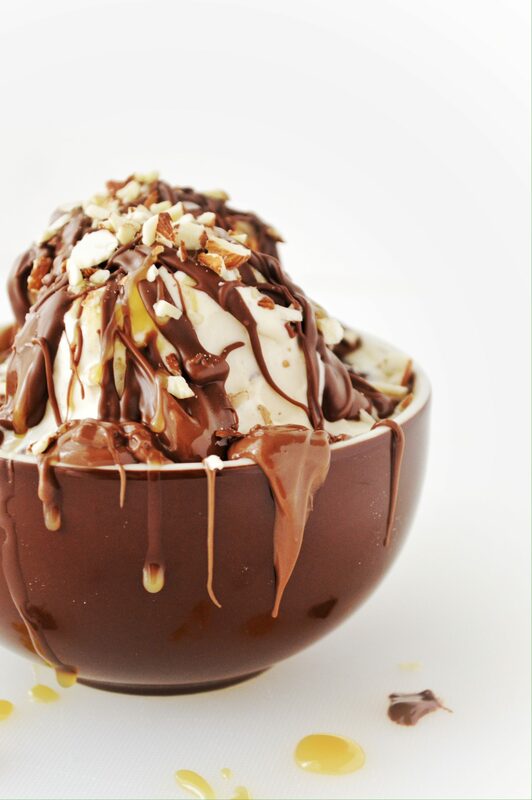 Haii this lookss heavnlly waitng to try.. But one quest if nt microwave then how to??? Hii Shimna! This brownie is to be made in the microwave dear. Hi I just wanted to ask when I put this in the microwave do I put it on oven mode? You have to put it in microwave mode.